The Granit Xhaka deal, the three day snapchat stake out, is done! I know this is a little belated, but how great is it to get business done early? So refreshing, as an Arsenal fan at least. Anyways, if you didn’t guess, this is just a vignette on Xhaka and what his signing means to the club and the starting 11. Now this gives me a chance to do what I actually wanted to do: give you is an understanding of who this young Swiss player is. Perhaps we’ll even venture to compare his potential to that of previous Swiss players who wore the shirt… Okay, that wouldn’t actually be too exciting. He’s got at least a 90% chance to be better than Djourou and Senderos. The other 10% is just in case he becomes Diaby 2.0.
Who are ‘Gladbach? Well, let’s talk about the Bundesliga first and we’ll put it like this: Bayern were so dominant in the Bundesliga, they gave up a total of 3 goals in the second half. An entire season. THREE second half goals, even with plenty of Javi Martinez starts at centerback. Not to mention during the latter half of the year, they seemed to always be without Robben, Boateng, Ribery, and other firm starters. So does that make other teams THAT bad? Probably, everyone in the bottom half at least, but let’s not discount who’s just below Bayern. Let’s take this Borussia side, for example, who started their season with five straight losses and had their coach, Lucien Favre, resign. Enter Andre Schubert, give Xhaka an armband, and Bob’s your uncle, we’ve got a side competing for Champion’s League play yet again. Okay, we simplified that a tad. There’s a fair bit that comes into perspective on Xhaka here. Giving a 23 year old the captain’s role is tough after all, but made easier when your squad has only three players over 28 with more than 10 appearances in the league. So, with a young team without much steady on-field guidance, how do you play? Long balls and counter attacking, obviously. Lots of crossing, lots of switching, plenty of over the top plays to wingers. Pretty much just bombing the ball up field and trying to get a touch in the box, hoping to stir up mayhem and madness.In the end, however, Granit’s role in this system, along with the captaincy, are what make it difficult to contain my excitement and limit my expectations for his arrival. Taken for Granit: What does he do? Let’s get the stereotyping out of the way. In a good performance, he makes over a 100 passes and leads Gladbach in touches and passes just about every game. He has somewhere between 10 and 15% of Borussia’s total touches per match, and completes an average of 86% of his passes. He is sharp in the ball, though he does look to create through a longer average pass length than what we’ve seen from Arsenal. He’s not exactly a Pirlo style creator, but can open up team’s defenses with surprisingly accurate long passing. Satisfied with the window view? Don’t worry, he’s a lot more than just a “new Arteta” (though I do love me some Arteta). What Granit’s style reminds me of is Busquets; the passing, the size, how he opens up to passes. But what makes the Busquets comparison even more relevant, and raises his stock more, is how he operates in the back line. His positioning and approach for Borussia Monchengladbach in the few games I’ve seen of him this year show an impetus to improve the defense from Wenger, and there’s no surprise there. Often, you see Xhaka drift into the back line, specifically when the right back steps to counter. In that build up you see a lot of his involvement as well, but his reactions show a commitment to defensive form while in possession. I’ll wrap up this section with a video. It won’t really give you an unbiased view, but you see the passing and vision I’m talking about. Granit Xhaka, our guy, broke into the squad for Basel back in 2010. Unless you’ve lived under a rock (in a football sense) for the last 6 years, you’ll realize he came up with another certain Kosovo-Swiss kid, Xherdan Shaqiri. 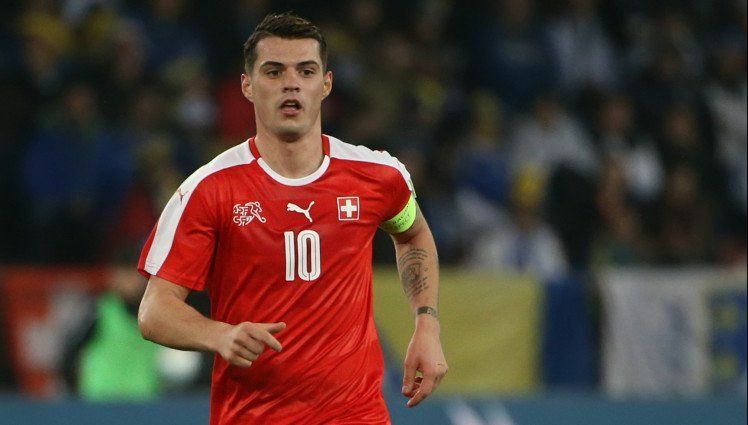 Now to use what will be the most abuse-able quote from his past, former coach Thorsten Fink, once stated of the two, “Xherdan Shaqiri is the best talent in Switzerland…after Granit Xhaka.” Wow, that sounds really familiar…. Where did I catch that one before? Oh yeah, that one guy, Mohammed Elneny. Here you go, first paragraph. Think about it: center mid brought up alongside a flashy winger, under-appreciated, but still had clear potential at a young age, FC Basel. The three true keys to a quality Arsenal DM anymore. Cutting out the parallels and coincidences, I do think these guys look like a firm pairing and, now that Xhaka has signed, the preferred guard ahead of Koscielny and co. The focus of his play will see him do make the work easier for other strong pieces around him. His vision allows him to recognize where cover is needed when facing the counter. It also affords him intelligent moves forward to act as a sink when Arsenal would be playing in the box. So often in these games, the counter is produced pushing out from the top of the box in the center of the field. After all, playing through the middle gives attackers a buffet of options. With someone to guard the centerbacks there, he can help to cut out counters and slow down opposition so numbers can get back. Koscielny and Gabriel have less to do then when other teams try to break, especially with Bellerin further up field. His mix of passing can revitalize an attack that has given up possession, pushing the ball back into the mixer. The passes he makes generally look to wing, so if teams do try to break through the middle, wingers out by the touchline will have a real opportunity to have a second go. That’s kind of a big ‘if’ with how Arsenal play, but this is all about potential and Xhaka offers elasticity in attack that wasn’t there before. There are two main concerns I have. The first is kind of obvious; I don’t think he’s the most disciplined player at 23 years old. I really don’t expect him to be, being a kid, but there’s the potential for some growing pains. He did have 3 red cards this past season, with two coming off of a second yellow. Maybe this was an issue in relation to his defending. I do think that he’s a great positional defender. Coming into the tackle, while he certainly has the strength, he can be clumsy. Going forward it’s something he definitely can and should focus to fine tune, but now it could use a brushing up. Maybe that speaks to the necessity to be pragmatic and break up play. The counter does leave a player in his position open to a countering counter, if you will. Still, with Arsenal’s style, that’s something he needs to do everything in his power to eliminate. The other concern the personnel around him, and that’s a theme that floats around the whole squad. I’m not concerned with center mid, I think he will pair with Elneny and, on a more defensive look, Coquelin just fine. The players in front of him, however, need to be improved upon. It’s a similar case with Ozil. We’ve seen what he’s capable of doing, especially now that he is well and truly settled, but there lacks the final touches to make those moves matter. Similarly with Xhaka, if he’s going to distribute the long ball, he needs a player with a better touch than Walcott to make that build up matter consistently. From what we saw, a forward and, in my opinion, another option on the right wing really bulks up the attack to what we expect. Clear some driftwood out (Walcott, Ox potentially) and we have a side that can most certainly compete for the title. So, to bring it to a full stop, Xhaka seems a great buy. He’s got elements of the departing Arteta, but A. he’s younger, B. he’s not being shoehorned into a position, being a natural defensive mid, and C. has a wealth of experience in the Champion’s League and wearing the armband, particularly for someone his age. Oh yeah, and he’s got some decent skill too. When it comes down to it, 30 million pounds may be a lot of money for one player, but this guy looks like a piece that could be a fixture in title runs for years to come. The kind that can really rock the Emirates. American football enthusiast looking to be the Happy Gilmore of Premier League writers.